Focus on Symbolism: Learners will identify key aspects of symbolism in literature. Today's Do-Now is located below the "Your Name" box: The rest of the questions refer to today's story. As you read “The Grandfather,” pay special attention to what the author, Gary Soto, says about the avocado tree planted by his grandfather. Notice how the tree’s meaning seems to expand as the tree itself grows over time. Grandfather believed a well-rooted tree was the color of money. His money he kept hidden behind portraits of sons and daughters or taped behind the calendar of an Aztec warrior. He tucked it into the sofa, his shoes and slippers, and into the tight-lipped pockets of his suits. He kept it in his soft brown wallet that was machine tooled with “MEXICO” and a campesino and donkey climbing a hill. He had climbed, too, out of Mexico, settled in Fresno and worked thirty years at Sun Maid Raisin, first as a packer and later, when he was old, as a watchman with a large clock on his belt. After work, he sat in the backyard under the arbor, watching the water gurgle in the rosebushes that ran along the fence. A lemon tree hovered over the clothesline. Two orange trees stood near the alley. 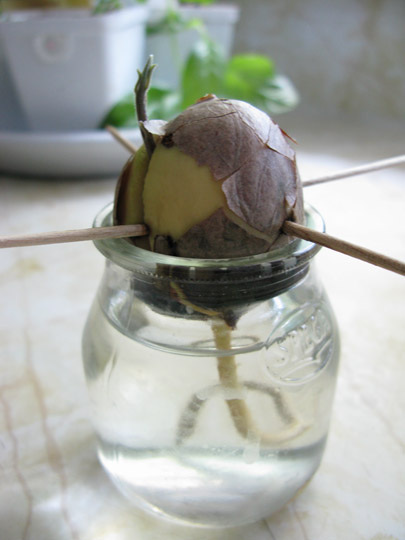 His favorite tree, the avocado, which had started in a jam jar from a seed and three toothpicks lanced in its sides, rarely bore fruit. He said it was the wind’s fault, and the mayor’s, who allowed office buildings so high that the haze of pollen from the countryside could never find its way into the city. He sulked about this. He said that in Mexico buildings only grew so tall. You could see the moon at night, and the stars were clear points all the way to the horizon. And wind reached all the way from the sea, which was blue and clean, unlike the oily water sloshing against a San Francisco pier. By the third year, the tree was as tall as I, its branches casting a meager shadow on the ground. I sat beneath the shade, scratching words in the hard dirt with a stick. I had learned “Nile” in summer school and a dirty word from my brother who wore granny sunglasses. The red ants tumbled into my letters, and I buried them, knowing that they would dig themselves back into fresh air. A tree was money. If a lemon cost seven cents at Hanoian’s Market, then Grandfather saved fistfuls of change and more because in winter the branches of his lemon tree hung heavy yellow fruit. And winter brought oranges, juicy and large as softballs. Apricots he got by the bagfuls from a son, who himself was wise for planting young. Peaches he got from a neighbor, who worked the night shift at Sun Maid Raisin. The chile plants, which also saved him from giving up his hot, sweaty quarters, were propped up with sticks to support an abundance of red fruit. But his favorite tree was the avocado because it offered hope and the promise of more years. After work, Grandpa sat in the backyard, shirtless, tired of flagging trucks loaded with crates of raisins, and sipped glasses of ice water. His yard was neat: five trees, seven rosebushes, whose fruit were the red and white flowers he floated in bowls, and a statue of St. Francis that stood in a circle of crushed rocks, arms spread out to welcome hungry sparrows. After ten years, the first avocado hung on a branch, but the meat was flecked with black, an omen, Grandfather thought, a warning to keep an eye on the living. Five years later, another avocado hung on a branch, larger than the first and edible when crushed with a fork into a heated tortilla. Grandfather sprinkled it with salt and laced it with a river of chile. “It’s good,” he said, and let me taste. I took a big bite, waved a hand over my tongue, and ran for the garden hose gurgling in the rosebushes. I drank long and deep, and later ate the smile from an ice cold watermelon. Birds nested in the tree, quarreling jays with liquid eyes and cool, pulsating throats. Wasps wove a horn–shaped hive one year, but we smoked them away with swords of rolled up newspapers lit with matches. By then, the tree was tall enough for me to climb to look into the neighbor’s yard. But by then I was too old for that kind of thing and went about with my brother, hair slicked back and our shades dark as oil. After twenty years, the tree began to bear. Although Grandfather complained about how much he lost because pollen never reached the poor part of town, because at the market he had to haggle over the price of avocados, he loved that tree. It grew, as did his family, and when he died, all his sons standing on each other’s shoulders, oldest to youngest, could not reach the highest branches. The wind could move the branches, but the trunk, thicker than any waist, hugged the ground. Click "Submit" on the above classwork. Watch Today's film, and answer the following questions about Symbolism.